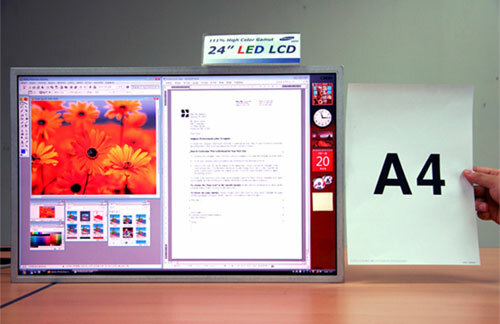 The Korean company’s latest 24in LCD monitor features an LED backlight that allows it to reproduce the vivid colours needed to appreciate an HD TV broadcast and also supports the WUXGA resolution of 1920 x 1200 pixels, which is the computer equivalent of full high-definition. HD TV aside, Samsung also reckons its 24in screen is an ideal fit for Windows Vista, occupying the same space as two sheets of A4 paper plus the size of the Vista sidebar. On top of all that, the new screen has an extremely wide viewing angle of 180 degrees that’s going to be pretty hard to top.